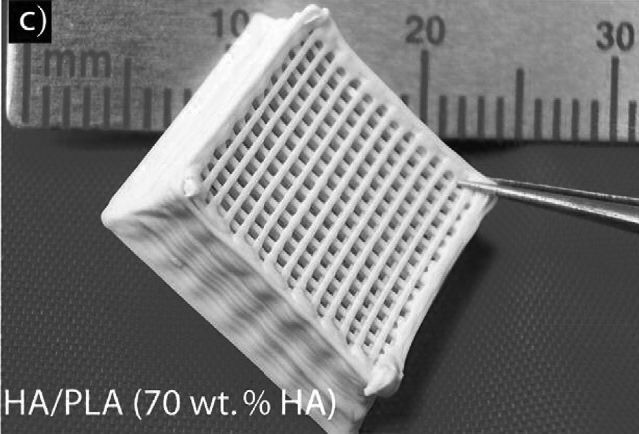 A key issue for the fabrication of scaffolds for tissue engineering is the development of processing techniques flexible enough to produce materials with a wide spectrum of solubility (bioresorption rates) and mechanical properties matching those of calcified tissues. These techniques must also have the capability of generating adequate porosity to further serve as a framework for cell penetration, new bone formation, and subsequent remodeling. In this work we showed how hybrid organic/inorganic scaffolds with controlled microstructures can be built using robotic assisted deposition at room temperature. Russias J, Saiz E, Deville S, Gryn K, Liu G, Nalla RK, Tomsia AP. Fabrication and in vitro characterization of three-dimensional organic/inorganic scaffolds by robocasting. Journal of Biomedical Materials Research Part A 2007;83:434–445.